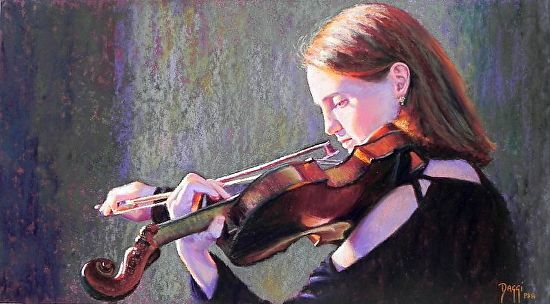 Ode to Joy, 11" x 20"
Californian artist, Daggi Wallace paints stories through her pastel portraits, focusing mainly on portraying the human condition and our connection to each other. Her work is intended to provoke thoughts and emotions in the viewer, which she captures easily by lighting, design, color and subject. Daggi works from photos she takes of her subjects, drawn to people that have interesting faces. "My work always begins with a visual trigger that evokes a strong emotional response. It could be an intense gaze or tilt of the head offering a glimpse of the subject's feelings that prompt me to paint a portrait," she explains. A Glimpse of Transparency, 12" x 12"
Daggi knew she was an artist the first time she walked into the studio of an oil painter in Berlin at the age of five. "There were canvasses, paints and brushes stacked everywhere. From then on, I was hooked, pretending to be a professional artist as I stood in my smock at my easel." She was accustomed to drawing with pencil and charcoal, but color at first was intimidating. Pastel, however, worked well for the stop and start mode she had to work in while her children were young and allowed for little cleanup. Even in pastel painting, quality materials are of utmost importance for creating good work with little frustration. Daggi is careful to purchase the best paper and pastels she can, knowing the right surface makes all the difference. Though brushes are not often used in pastel work, sometimes the underpainting requires brush work. For Daggi's work on sanded paper, she uses older brushes because the surface is hard on them. "I underpaint with either watercolor or I'll wet a layer of pastel with water or odorless turpenoid, using soft flat brushes most of the time. I also use brushes at times to make corrections by brushing off an area of pastel. Soft haired or bristle brushes work well, depending on the size of the area needing to be fixed," she shares about her process. Though brushes or solvent can be used for blending, Daggi prefers the look of the pastel on its own. "I try to keep my blending to a minimum because I like to see the strokes of the pastel. Some skin types or skies do require blending, and I will use my fingers sparingly and lightly, but even better is using another pastel to do the blending by applying it with just the right amount of pressure on top of other layers." Daggi has a natural instinct to give a voice to her subjects as seen in her portraits, choosing subjects she is passionate about. In 2010 she took her passion further and started a non-profit project called "Moni's Kids", painting portraits of children in need and using the proceeds to deliver aid to the children portrayed. The children help with the portraits, by drawing in the backgrounds. 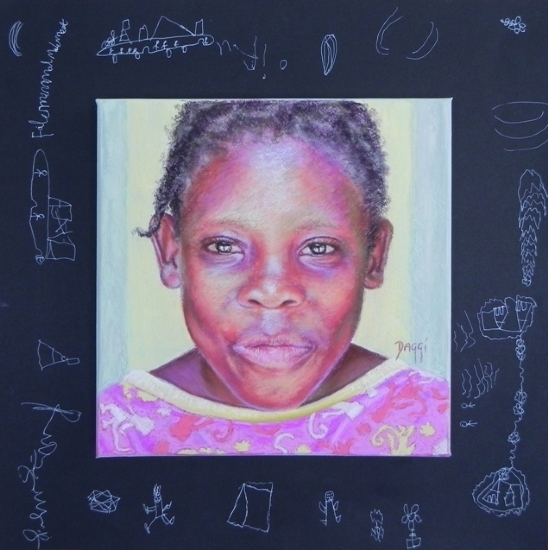 The first series of Haitian children was exhibited in Miami in November 2010. To learn more about Moni's Kids, click here. To see more of Daggi's work, you can visit her website or blog or view her work in person at some upcoming exhibits. She will be showing at “Less is More, Much More” exhibition at the Blackboard Gallery in Camarillo, CA. The reception and award ceremony is March 1, 2014 from 4-6pm and the show runs through March 22nd. There are also Open Studios every first Saturday of each month at Studio Channel Islands Art Center where she maintains her studio as one of 40 artists-in-residence. Daggi is also an exhibiting member with Manhattan Arts International. Pastel, whether oil or chalk, is thought of as the purest form of painting. The sticks of color are composed of primarily pigment, with very little binder. Although pastel is applied dry, usually, it is thought of as painting because the color is applied in mass, rather than in line. Both chalk and oil pastels are made up of pigment and a binder. For chalk pastels, sometimes gum tragacanth is used as the binder, which is made from several of the species of Astragalas shrubs of the Middle East, or the modern binder is methyl cellulose, a synthetic substitute. Chalk pastels range in very soft to hard, depending on how much binder and filler is used. Oil pastels are made up of pigments dispersed in wax and softened with a non-drying oil, like mineral oil. Oil pastels came out in 1925 in Japan, originally designed as a children's crayon. The pigments used to make pastels vary from permanent to fugitive and are sometimes mixed with one another for a range of hues. The type of pigment used to make a color will in turn effect how much binder is needed to hold the pastel together. As clay or whiting or other filler is also added to aid in the range of hues, this will effect the binder quantity and density of the pastel as well. Pastels are layered onto surfaces that have texture or grit to hold on to the pigment, as there is no liquid. The pigment is embedded into the surface from the artist's pressure and then grasped by the texture of the surface. 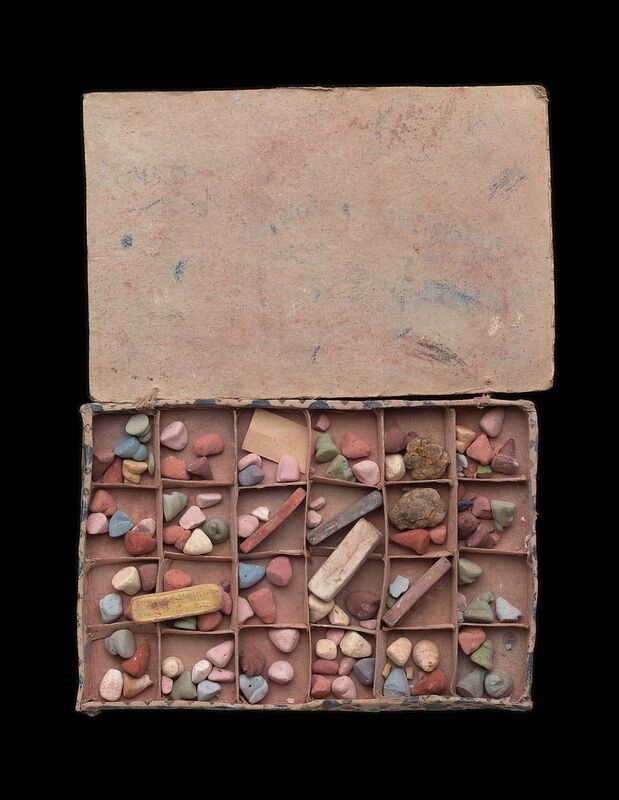 Often pastel surfaces have pumice to hold on to layers of the chalks. Since pastel is applied dry, most often artists don't use brushes for application, but some use brushes for blending, adding solvents, or laying down grounds for their work. With PanPastel's product of soft pressed pastel in a container, there is more need for pastel tools. To aid pastel artists in their blending or application, Dynasty has a line of brushes made specifically for pastel artists. To read more about our IPC (Ink, Pastel & Chalk) line, you can follow up with this blog post: Paint Brush Highlights: IPC. Although pastels can be easily bought from art material stores, artists can also make their own pastels. Recipes can be found online, or in some artist material books, like The Painters' Handbook by Mark D. Gottsegen or Painting Materials by R. J. Gettens and George Stout. Pastels and Pastelbord™ by Ampersand Art Supply, a pastel surface. Vermont artist, Mallory Bratton Rich works in both oil and pastel, showcasing the landscape around her native area in the north east and along the North Carolina coast. An active member of the Vermont Pastel Society and painting instructor, along with being a full time artist, Mallory began her art career late in life, with the encouragement of artist husband, Harry A. Rich. She worked in pastels for years before starting in on oils, admiring the impasto work she had seen. 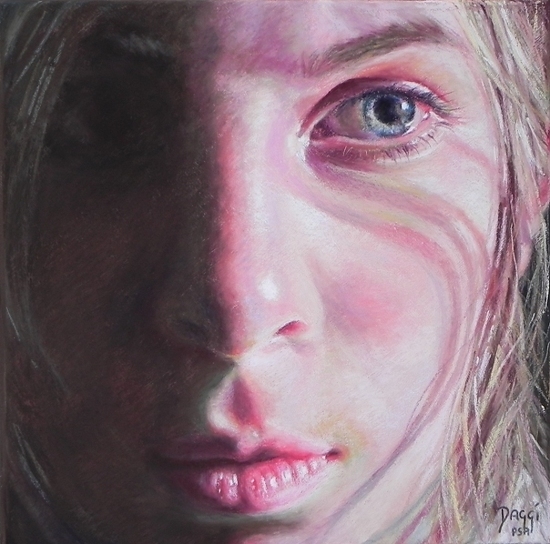 With a background strong in training from Albert Handell, Gil Perry, Stuart Shils and Virginia McNeice, Mallory has come into her own winning several awards including a finalist position in American Artist's 30th Annual National Competition. Mallory paints the atmosphere, the light, and the little changes in the land around her that she loves, both southern Vermont and coastal Maine. "I am after [painting] feeling rather than an exact representation of the landscape, and I am trying to develop brush techniques that convey that," she says. The soft luminescence and blending she gets in her work come partly with the quality of brushes she is using, preferably synthetic filberts. She explains, "A good brush is a joy to work with, and I love the ritual of washing them out at night. I notice I go to a half-dozen brushes every day, and totally ignore the inexpensive brush sets I bought when I was just starting out." Mallory will be teaching a workshop at the Southern Vermont Arts Center in August on landscape painting in pastels, which you can sign up for on this website. You can also see more of Mallory's work in person this coming year as she has solo shows and a pastel show in Sandgate this summer. To find out more, follow her website: www.malloryrich.com. She is represented by Gallery Wright in Wilmington, Vermont, by the Atchison Gallery in Birmingham, Alabama and online by Manhattan Arts International, with an interview on that site as well here: Interview-with-artist-mallory-rich.